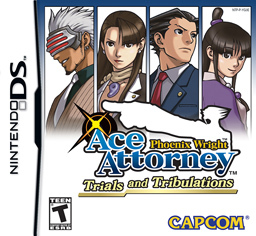 Phoenix Wright: Ace Attorney Trials and Tribulations, a visual novel adventure game developed and released by Capcom, is the third game in the Ace Attorney series. The game focuses on attorney Phoenix Wright as he defends his clients against murder charges. The gameplay alternates between Investigation and Courtroom modes. Trials and Tribulations, like other parts of the series, consists of several cases and trials referred to as Turnabouts.